What do I need to read the eBooks I have purchased on a computer? How do I read IQRA' eBooks on my Android device? How do I download my subscribed IQRA' ebooks to my PC/Mac? Adobe® Flash® Player is a cross-platform browser-based application that provides uncompromised viewing of expressive applications, content, and videos across screens and browsers. You need to install Flash Player in order to use the online eBook reader. You can download Flash Player here. From your account, click "Profile Setting," then "Change Password." You will be prompted to enter your old password and your new password. Once you login to the eBook site, you will be redirected to 'Bookshelf' page and you will find the 'Redeem Access Code' box here. Copy and Paste the access code (please ensure that you do not include any spaces) in the given box and click 'Redeem' button. iPublishCentral reader is a computer application for Windows PCs that allows you to read your books offline. It functions similarly to the web based online reader. Please note that the iPublishCentral reader does not work on tablets unless it is running Windows. Once you login to the eBook site using your account you will notice a button “Download iPublishCentral Reader”. Web browser with Flash Player installed. Examples include Internet Explorer, Firefox, Chrome,Safari, and Opera. Our e-books can be viewed on any computer or hand held devise that is equipped with Adobe Flash Player. For offline reading, you can install the iPublishCentral reader by clicking the "Download iPublishCentral Reader" button from your online book shelf. All content can be downloaded for personal use using the iPublishCentral Reader/iPad/Android app. IQRA eBooks are not copies intended for printing. IQRA Publishers allow no printing or copying on eBooks. IQRA' eBooks supports Android Tablets and Smartphones running 2.2 and up . IQRA' eBooks supports the iPad, iPad Mini, iPhone, & iPod Touch running iOS 4.0 or later. 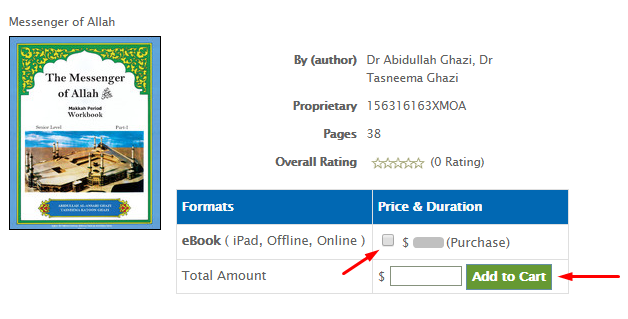 Login to to IQRA' eBooks using your registered credentials in the “Account” tab. Then, tap on the “Close” button to close the “Account” window. Next, you’ll tap on the “My Bookshelf” tab at the bottom of the iPad app. Click on the Read option to open the eBook and read offline. Please register yourself on the IQRA eBooks website. Once you have registered successfully, please search for the eBook that you wish to purchase. Click on the checkbox next to the price and click on Add to Cart. Note: We do not support purchase using PayPal accounts directly. A charge will immediately appear on your bank statement under the name “eBook Sale” for the purchase of your eBook(s). Once the purchase is confirmed, the eBook will be immediately added to your account.